The Any Temp® H-3000 series water riser heated hydrant gives year round water service with use of self-regulating heat cable or by draining itself below the frost line when shut off. 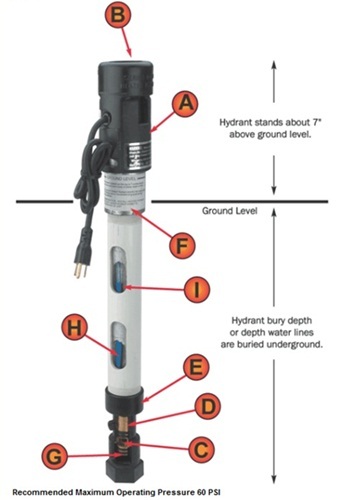 The heated hydrant is a simple unit designed to provide frost proof water service. 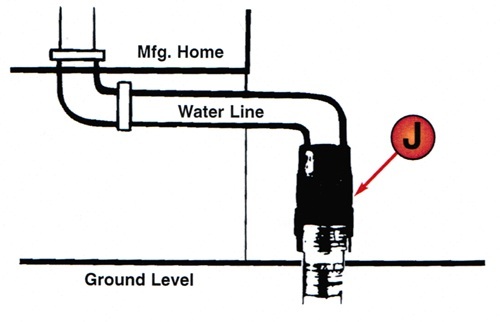 It completes the installation from buried water line to above ground water connection, or supply pipe with shut-off valve, needed for each mobile or manufactured home. Recommended maximum operating pressure 60 PSI. Comes with drain hole in valve body. 5 watts per foot self-regulating heating cable, Ethafoam insulation, simple sanitary straight line design. B - Outlet of Hydrant 0.75 inch pipe thread molded into Zytel® Super Tough by DuPont, one of the worlds toughest thermoplastics. E - Heavy Molded Delrin® Valve Body Delrin® has been used in valves for over 40 years and is molded to close tolerance. Helps prevent corrusion or rust. 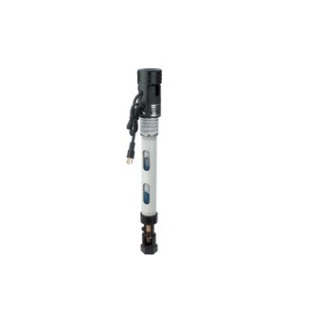 Go to top of this Water Riser Heated Hydrant, 3 ft bury depth, 0.75 inch Copper Pipe page.